Feel like baking an Irish Rum-cake... and then eating it too? The premise of Chapter 7 is simple — each cask of Whisk(e)y is unique. The wood, age, temperature, location… everything makes a difference and tells its own story. Single malts sit in barrels before bottling, so that the Master Blander can try to make them all taste the same. The folks at Chapter 7 think that Whisk(e)y deserves to be individual. Chapter 7 is the brain child of Selim Evin. He makes regular visits to Scotland and Ireland to hand select single casks from the inventories of the world’s greatest distilleries. Then he custom bottles each one with its own story. How many bottles? Well, until the barrel is bone dry. 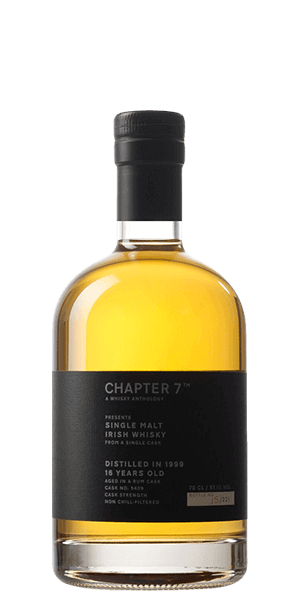 Chapter 7 Irish Whiskey 16 YO is #5409 — aged in a Rum cask, not finish-aged... it's a premium Whiskey that has rested in a spicy Rum cask the entire time. The result is fun and surprising. You get grain, honey and spices on the palate with a fresh Whiskey bite. It definitely has a unique character and an enigmatic “viscous but wet” mouthfeel… like drinking quicksilver. If you are an Irish Whiskey fan, this is a very interesting step up and one that you should definitely consider. What does Chapter 7 Irish Malt 1999 16 YO taste like? The Flavor Spiral™ shows the most common flavors that you'll taste in Chapter 7 Irish Malt 1999 16 YO and gives you a chance to have a taste of it before actually tasting it.